The Celandine flower is a very bright yellow. Lesser Celandine (ficaria verna) (prior to 2010 it was named Ranunculus ficaria) is an attractive lawn weed which is not very common. It can establish itself very quickly across a lawn where it does manage to take hold. Lesser Celandineis a perennial weed, persisting in the lawn throughout the year. It flowers in spring. It has very distinct, heart-shaped leaves that are hairless and dark green in colour. They are sometimes variegated (lighter streaks through the leaf) and can be over 3cm long and 2cm wide. In Manchester, Lesser celandine produces flowers in March, April and May. In some parts is often referred to as the “spring messenger”. 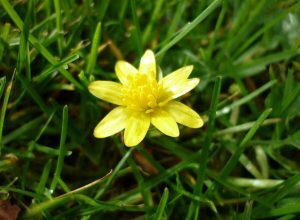 The flowers are similar in colour to a common buttercup (bright yellow), but are a little larger and the petals of the flower are thinner. It is a pretty little flower and has inspired many famous poets and writers over the years, including William Wordsworth and Edward Thomas, but the huge swathes of Celandine in woodlands that inspired these minds are much less common today. The leaves of a Lesser Celandine plant are very distinctive. 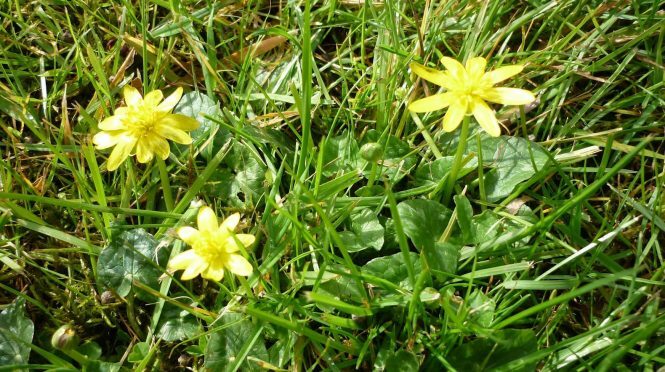 Lesser Celandine is easily controlled in lawns. A Regular lawn treatment in spring will take care of any infestation in a lawn. 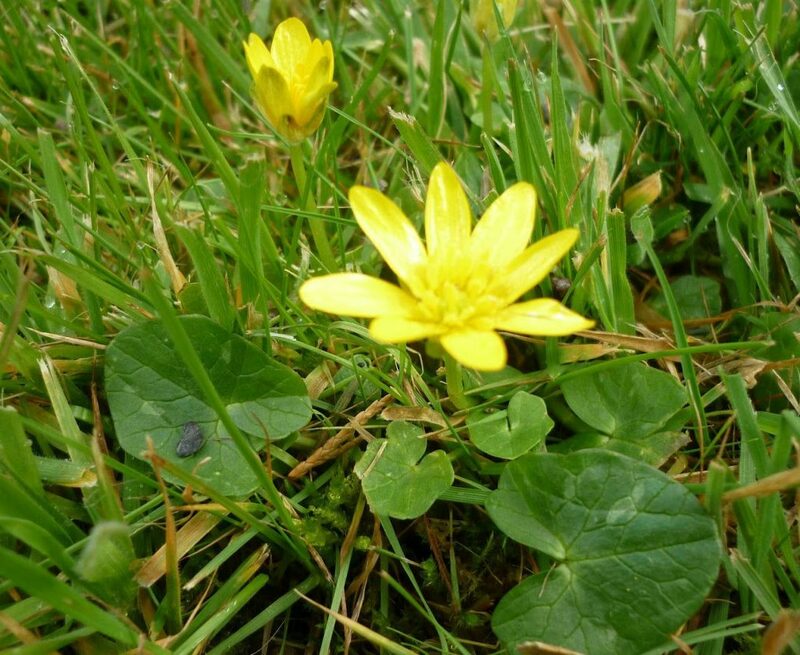 If you have a problem with Lesser Celandine in your lawn, then get in touch. I will be happy to advise. I have Lesser Celandine in my lawn & flower beds. I was told I could use roundup but not on my lawn. Could you tell me what I could use that would not kill my grass? It is beautiful but is taking over my yard. I have a little under two acres. I don’t live in the US and this blog for British lawn owners, so I can’t offer any recommendations I’m afraid. I suggest you contact your local lawn care company, as they will be able to apply a selective weed killer for you.